Fran's House of Ayurveda: Sign up to my Recipe Club! Sign up to my Recipe Club! Several years ago I started a recipe club of delicious vegan dishes, inspired by Kittee at PakuPaku who had done the same by mail. Recently I changed the focus to vegetarian* AYURVEDIC recipes! By joining my Recipe Club you'll receive a few recipes a month by e-mail... expect anything from ginger cookies to soothing dahl soups to crazy salads to tofu dishes... and I welcome recipe contributions! UPDATE! It's been a year since I've become a new mother and let me tell you, having a child takes up quite a bit more time than expected! So, it's with lament that I have to put my recipe club on hold indefinitely. Whenever I can I'll be updating this site with new recipes, maybe once every month or two, so do drop by once in a while! Many thanks to all you wonderful readers!! *Although I consider myself vegan at heart, following Ayurvedic nutrition principles includes using honey, yogurt and ghee (clarified butter), and sometimes eggs (that's an ongoing debate), and is otherwise animal-free! 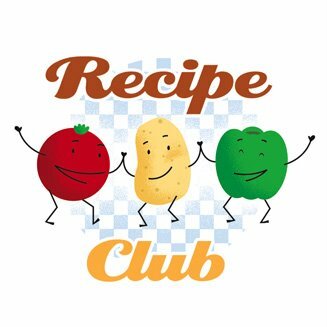 Recipe Club has the coolest, cutest logo and mascots ever! I could never ever eat them cause they're so cute and dancing together! it would be very helpful if the receipes could be listed according to entrees, desserts, baked goods, etc or alphbetically. Hello there - I am an Ayurvedic Health Consultant based in UK and have a small clinic where I practice. I also teach clients how to cook food as well as cook recipes for healing the self. I would be delighted to add some to your list if you were interested. What a great service. I'm so excited to benefit from your hard work. Thank you! Hi,Just stumbled onto your blog which is great!as is this recipe club initiative,would love to join! I have learned a bit in the past about Ayurveda and am a firm believer continuing to follow what I already know and would love to learn more.Lately having turned Vegan,I try to resolve issues like Ghee which I have seriously learned its beneficial effects on my body..hmmmm. Glad to meet someone with similar debates..would love to hear more about your views,if youd like to share! :) Thanx,Mia. I would like to introduce myself Anitha Mohanasundaram I am the head of operations for the company called Mooksha ayurveda based out of santa clara California. What a great site! How do I join your recipe club? Where do I send the email? I just made roasted beet & quinoa salad and cream of celery soup for dinner tonight! I really love how simple these recipes are.. I always feel like all the recipes I find call for half a dozen strange and single-purpose kitchen tools that I have no room or want for.. I love your simple, wholesome recipes! Thanks for creating this blog! Thank you for adding me to your recipe club. I am a Vata with a Kapha imbalance. Please sign me up for your recipe club. I am a Vata with a Kapha imbalance. Hi Sarah! Thanks for visiting, and sorry, my recipe club is on hold indefinitely while I raise my daughter and write my book. All the best! I am having a terrible time sending you an e-mail to join the recipe club AND sign up for (non RSS) posts notices, so I am commenting in order to find your e-mail address (so I don't have to post mine publicly. Help?! my name is renata, ia am a ayurvedic life style councellor from slovakia.I have found your recipes simply original, love especially the added recommendation for each dosha so everyone can enjoy every recipe with a slight alteration.Since i am working on my own webside offering different services i was wondering if i could publish some of your recipes in my language?Please let me know on macko3@ymail.com.Will be looking forward to your response. I will be attending a yoga workshop in a few weeks, and one of the sessions will be a Ayurveda workshop and cooking class. Found you website and so helpful to read. Want to join your recipe club as part of my yoga learning curve.